Exacter's Vision Analytics® Grid Intelligence System delivers health assessments for overhead distribution systems. Similar to how an x-ray or MRI scans a body to reveal injuries, Vision Analytics scans overhead distribution infrastructure to identify where problematic conditions (arcing, leaking, and tracking) are present. Deployed as a longer-term strategy to improve system performance and reliability, Vision Analytics is a three (3) step process. Pre-Assessment Interruption Data Analysis Exacter analyzes interruption data to identify where equipment related outages occur on the overhead distribution system. Circuits are normalized by overhead miles and a Pareto analysis is performed to rank circuits based on their contribution to overhead equipment interruptions. 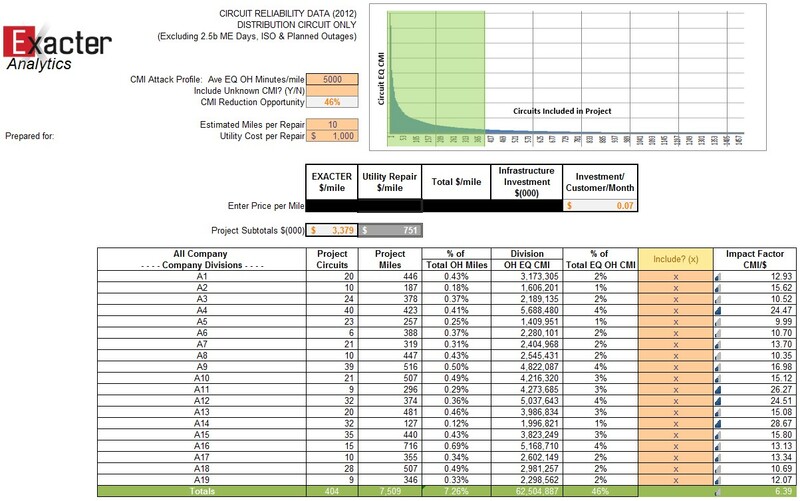 The analysis of interruption data allows Exacter to optimize a project design for a utility based on where equipment related outages occur and the utility's desired improvement in system performance and reliability. The pre-assessment analysis provides utilities with the expected long-term improvement in performance and reliability, and the metrics that Exacter will use to track the benefits of Vision Analytics®. Exacter System Health Assessment - Vision Analytics® is powered by Exacter's patented technology and proprietary data analysis that discriminate, identify, and pinpoint locations where arcing, leaking, and tracking are present. The system health assessment consists of two technologies and proprietary analytics. Patented Radio Frequency Technology - (RF) Exacter's patented RF technology scans selected circuits, captures Partial Discharge (PD) and Electromagnetic Interference (EMI) emissions, and correlates emission data with GPS location data. Failure Signature Analysis - Exacter has developed the Failure Signature Library™, a catalog of specific emissions that are associated with equipment displaying problematic conditions and degradation. Proprietary time-domain and frequency-domain analysis detect and discriminate Failure Signatures to identify locations (structures) where arcing, leaking, and tracking are present. - Exacter Field Engineers visit the locations and structures identified by the patented Radio Frequency assessment and proprietary Failure Signature analysis. Using Ultrasonic Acoustic technology engineers confirm and pinpoint the component responsible for the problematic conditions. Field Engineers take a high resolution image of the identified component and record physical attributes including GPS coordinates, structure ID tag, closest physical address, and description of component location on the pole. Criticality Measure & Trend Analysis - When correlated with GIS connectivity and asset management data, Vision Analytics can identify a criticality measure, the number of customers that would be impacted by an equipment failure. The criticality measure allows utilities to make strategic decisions and perform the appropriate maintenance operations to achieve a desired improvement in system reliability and performance. Once the utility performs desired maintenance operations, Exacter will track improvement in system performance and reliability using metrics and benefits identified during the pre-assessment analysis. LEARN MORE AT AN INFORMATIVE EXACTER WEBINAR. HERE IS A PREVIEW!